Sherlock Holmes is one of the most prolific fictional characters ever created, with the numerous adaptations of Arthur Conan Doyle’s novels reaching audiences through the mediums of television, film, theatre, comics and even video games. In recent times the famous detective has been portrayed by Benedict Cumberbatch in the popular BBC series Sherlock, Johnny Lee Miller in Elementary and Robert Downey Jr. in Guy Ritchie’s two Sherlock Holmes blockbusters. It seems odd that a once stuffy relic of the Victorian era has had three hugely popular modern makeovers, cementing the re-emerged popularity of Conan Doyle’s creation. 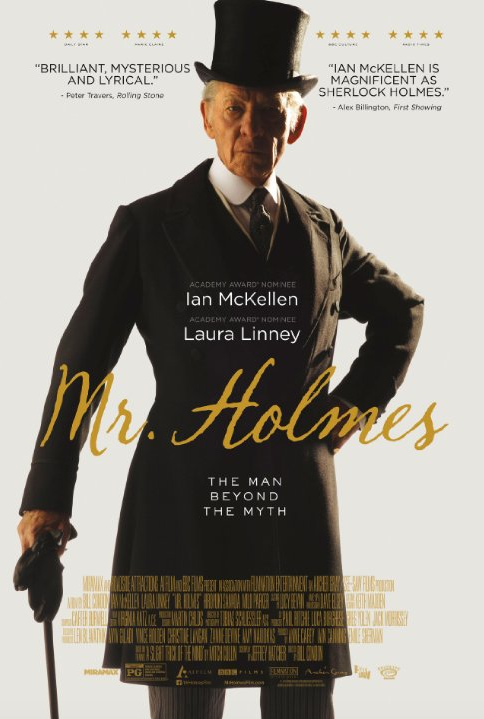 Mr. Holmes is the latest and most unique take on the icon, with an extraordinary and poignant portrayal of the aging detective by Sir Ian McKellan. Set in 1947, we meet McKellan’s 93-year-old detective at a reflective time of his life as he travels back to his seaside cottage along the Sussex coast. There, his long suffering widowed housekeeper Mrs. Munro (Laura Linney) and her precocious young son Roger (Milo Parker) each play their part in helping Holmes live out his final days in peace and harmony. The three make an odd sort of family, as Dr. John Watson has long since passed, and Holmes has only Mrs. Munro and Roger left to take care of him. Before he looses his memory completely, Holmes is determined to finish re-writing a story Watson wrote about their famous last case together. In his words, he must ‘get it right, before I die.’ In Watson’s version of the story, the case ends with a happy ending, yet Holmes, even with his ailing memory, knows it ended differently. Told in flashback stages, the case involves a young couple; the husband (Patrick Kennedy) fears his wife (Hattie Morahan) is drifting away from him and she is revealed to be hiding a secret. Holmes remembers that something went horribly wrong in the case, yet the recorded fiction from Watson seems to be false. Based on Mitch Cullin’s novel A Slight Trick of the Mind, the film shows us a side of Holmes that we rarely get to see. Rather than arrogantly making clever quips and performing death-defying acts like modern adaptations show him doing, this Holmes is steeped in poignancy, empathy and guilt. The film’s main focus is on the detriments of old age and the humiliation of losing one’s mind. As the film progresses, we slowly see Holmes lose more and more of himself, forgetting simple things at first and then larger things that have tragic consequences on the lives of those around him. It’s hard to believe that McKellan has never portrayed Holmes before. His eloquent voice and noble presence plays a powerful part in what makes the film a success. He is able to bring out numerous emotions in the audience, from the joy of laughing at his witty comebacks to feeling sympathy for his deteriorating state, and he does so in a dignified, elegant manner. Perhaps a prequel with McKellan’s real life BFF Sir Patrick Stewart as Dr. Watson is in order. There are, unfortunately, only two major female characters in Mr. Holmes, Mrs. Munro and the wife from Holmes’ last case, Ann Kelmot. Although they are both relatively small roles, they explore societal expectations and pressures placed upon women in the early 20th Century. Mrs. Munro is embarrassed by the fact that she has no formal education and now, as a widow, must care for her (slightly ungrateful) son as a single mother. Ann on the other hand is in an unloving marriage after having two miscarriages, which has left her in a perpetual state of melancholia. Both roles are played with sensitivity by Linney and Morahan, and establish the tragic truth that women didn’t have much power over their lives in the first half of the century. Mr Holmes is a smart, charming, quaint and very British film that is a pure delight to behold. With sweeping English landscape and beautifully crafted period sets, it’s a visually stunning film. McKellan’s performance is one of the year’s greatest so far and he brings a lovely poignancy to the legend of Sherlock Holmes, who it seems will never fade away.